Meyer Sound and Fantasy Studios recently collaborated on the newly re-launched Fantasy Film Center in Berkeley, CA. Featuring a state-of-the-art Meyer Sound cinema system, the completely refurbished historic Fantasy Film Center now has a new 5.1/7.1 monitoring system comprised of three Acheron 80 screen channel loudspeakers, 10 HMS-12 surround loudspeakers, two 650-P subwoofers, and a Galileo loudspeaker management system with one Galileo 408 and one Galileo 616 processor for system drive and optimization. Outside the film center One of the most esteemed full-service studios on the West Coast, Fantasy Film Center and Fantasy Studios have attracted the recording, film, television, and video game industries for decades. More than 200 films—including the Oscar-winning classics Amadeus, The English Patient, and The Right Stuff, as well as the cult classic Blue Velvet and the blockbuster Boogie Nights—were mixed onsite. The facilities have been used for post-production work on acclaimed films including Apocalypse Now, Good Will Hunting, Fellowship of the Ring, Sixth Sense, Moneyball, and many of Pixar's films, such as Finding Nemo and Toy Story. The Bay Area landmark is where platinum recordings by Green Day, Journey, Aerosmith, Creedence Clearwater Revival, Santana, and countless others have come to life. 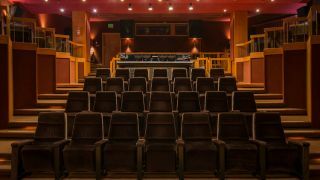 First opened in 1981 as The Saul Zaentz Film Center, the refurbished 1,820-square-foot mix theater seats more than 50 guests and now boasts the latest technologies while preserving the pristine sound and feel of the original. Originally designed by sought-after screening room designer Jeff Cooper, Fantasy Film Center’s renovation was overseen by Bay Area engineer Jim Austin along with Fantasy staff members Alberto Hernandez and James Gangwer. Key involvement came from both Meyer Sound and Avid.